On Saturday I baked two breads that have been on my list for quite a while. Hans Joakim has posted on one of his favorite breads several times in recent months (here, here, here, and here) and I really wanted to give that Pain au levain with whole wheat a try (Hamelman, “Bread” p. 160). And as you know, when Hans Joakim presents something, it always looks so very enticing. We really love it! 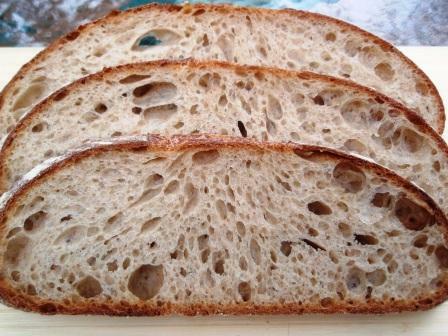 The taste is excellent, the crust strong and the crumb wonderfully open. Amazing that the kneading time is only about 2 minutes, and then just two folds at 50 and 100 minutes! That’s it! I will definitely make this again! I couldn’t have chosen a more different bread to be its partner: the Buttermilk-Whole-Wheat-Bread that JMonkey (here's the recipe from Laurels Kitchen Bread Book - I used the biga approach) and Salome have posted on (here and here). This dough, in stark contrast to the above Pain au levain, needs to be kneaded for a very l--o--n--g time. It turned out very well, even though I over-proofed it (when I scored it, it made pouf, and the loaves sank somewhat; I think I should have skipped the slash altogether). The problem is always the timing. To make Saturday’s loaves (4 of them), it took about 8 hours, and to always be around when the next fold or shaping, etc., is due, is very difficult. Despite my careful calculations, when my son’s soccer game went into over time (i.e. got delayed), my schedule was pouf, gone as well, and my proofing went into over time too… (by about an hour!). Also, I have basically never baked bread in pans, but for the school sandwiches, I guess that is a good shape. I used 100% white whole-wheat flour (from Trader Joe, first time I bought this) and cut the honey in half. I also added two Tbsp of ripe starter, as Salome suggested she might do in a further test. It happend because of your posts! Your Pains au levain were so beautiful with such open crumb that I could only hope to produce something vaguely similar. I was very happy about the result! I can just echo hansjoakim's reaction. Amazing, beautiful loaves, Chouette! Just this weekend I read through your entire baguette experience and printed out some of your recipes and experiments. What an adventure! And how incredibly helpful to the ones of us who are at the beginning of the baguette-road. They, besides the rye, are one of my next projects. Thanks for sharing that, Chouette! It's nice to know that sharing my experiences has been helpful to others. That's always my hope when I share them. Beautiful. Fantastic crumb. 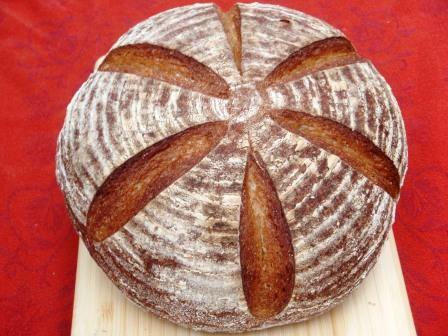 I think I'll give the levain this weekend a try. I have to bake bread for a potluck family gathering. I'm happy you tried and liked the buttermilk bread! Your Pain au levain with whole wheat is fantastic! Your results are proof you enjoying "Bread" as much as I am. I think you nailed it perfectly. 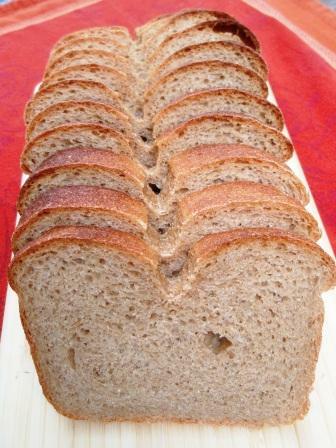 Your Buttermilk-Whole-Wheat-Bread looks like great bread. I have the same problem with timing. My best laid plans occasionally fall apart due to circumstances. You managed to rescue yours in a fine way. Good job and thanks for sharing. ... Salome, Eric and Wally! Yes, this is really a great formula. I have had the book for only a few weeks, and another few weeks from the library before that, and the few recipes I have tried so far all turned out so very good. The sourdough is maturing now over night! Big baking day tomorrow. Can't wait to see the outcome! bää. I'm not very satisfied. Oh no, that's a pity! But you know that you are one of the star bakers here!! Maybe your starter is a bit sluggish? I don't know. I never thought about my starter being weak. Maybe I should give it a booster weak, two feedings a day...? I wonder whether that would improve the results. But, it's a fact - I have never achieved such fantastic (=open) crumbs as others do here. Only if I bake with very high-hydration doughs, never when I bake with hydrations around 65, 68%...If I would just know why!